For the Canucks, simply getting back to the post-season would be a successful season, but that could be tough to do following an off-season in which the team said goodbye to Kevin Bieksa, Eddie Lack, Nick Bonino and Zack Kassian. Vancouver’s playoff hopes could hinge on the aging Sedins. Sedin twins, who turn 35 this year. The Canucks, who were the Pacific Division’s second seed with 101 points, will take a tumble. Radim Vrbata. After Vrbata’s 63 points, the next-best Canuck was Bonino with 39. 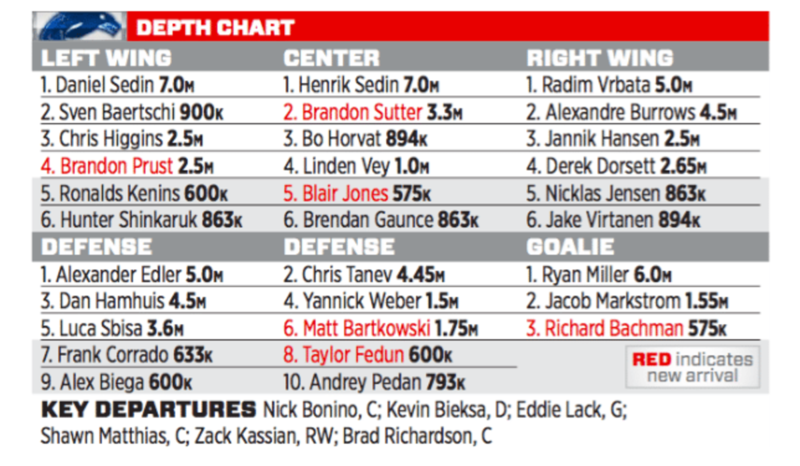 With an even less talented supporting cast, Vancouver needs Sutter to produce as a No. 2 pivot. Jacob Markstrom, who has been a stud in the AHL but has struggled in the NHL. The Canucks think he’s ready for the permanent jump. Milan Lucic and replaced youngster Kassian with veteran Prust. Whatever Benning’s intentions, his club is set up for a disappointing finish. Best-Case Scenario: If the Canucks can manage to recreate their 2014-15 campaign, that would be about as good as Vancouver could hope for. Few would have expected the Canucks to challenge for top spot in the Pacific Division this past season, especially considering their 83-point performance in 2013-14 under coach John Tortorella. Their off-season was a baffling one in many regards and it’s hard to say the team has truly improved in time for the 2015-16 campaign. The Sedins are still the Sedins, though, and maybe this roster has some magic left. Worst-Case Scenario: The Sedins are entering their mid-30s and there’s eventually going to be a drop off at some point. If it’s this season, that’s not a good thing for Vancouver. They’re still the two catalysts of the Canucks’ offense and should they have a repeat of the 2013-14 campaign — a disastrous one for the Sedins — it’s hard to see where the top-flight offense will come from. With Lack gone, another mediocre season from Miller could also leave the Canucks with buyer’s remorse when it comes to the veteran netminder. Who To Watch: It took Horvat a while to get going in his rookie campaign, but his play in the post-season should be cause for excitement among Canucks fans. In the post-season, Horvat notched one goal and four points in six games while playing third-line minutes against the Calgary Flames. Acquiring Sutter from the Penguins means Horvat has time to develop into a top-six center, but he could very well become one by the time the Canucks play Game 82. He’s already shown the two-way ability that makes him a great option up the middle, and if he can add a bit more offense to his game in 2015-16, Horvat could be the bright spot of a down season in Vancouver. Click here for more detail on these predictions. After a 100 point season and a playoff berth, the Canucks are projected for a big crash towards the basement this season. According to their projected WAR, the Canucks don’t have many things going for them thanks to a bottom five forward group and goaltending which means that they’re a long-shot to make the playoffs. Vancouver’s biggest undoing, though, is themselves. The team had the worst off-season on paper of anyone in the league to the cost of three true-talent wins. Nearly everything Vancouver did this off-season was a mistake that weakened the team’s depth. The Prust-Kassian swap was perhaps the most confusing as Kassian is a solid depth contributor, while Prust is completely replaceable. Chris Tanev, and they still have the Sedin twins at their disposal (although they’re getting up there in age). They’re the only thing keeping the Canucks afloat and if they don’t drop off too much then the Canucks might be able to stay competitive. Alex Burrows is still very solid despite his point totals decreasing and Vrbata is probably underrated here, but after that there’s not much to like. 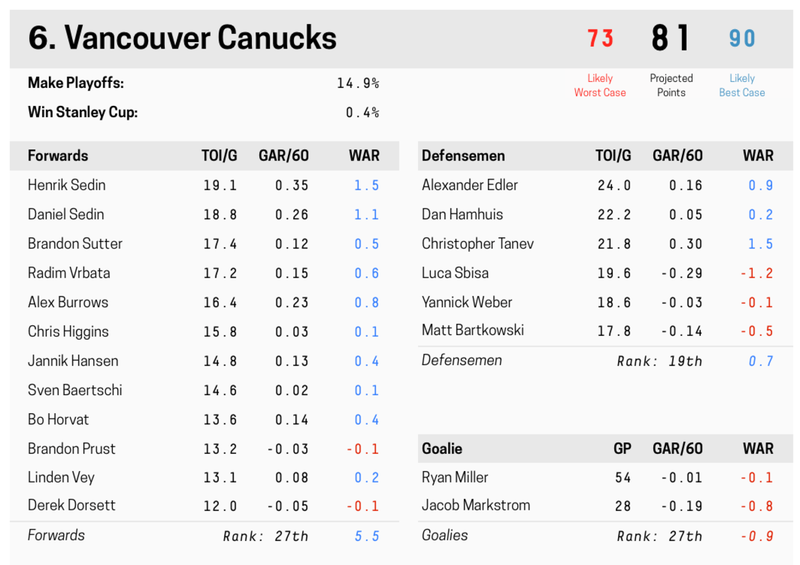 Goaltending is another trouble spot as the Canucks shipped out the very capable Lack in favour of retaining an aging Miller and Markstrom, who has been awful at the NHL level. Miller may be able to bounce back after a troubling 2014-15 campaign, and Markstrom may be able to repeat his AHL performance from last season, but the likeliest scenario points to the tandem being among the league’s worst. That alone might be the Canucks undoing. THN is rolling out its 2015-16 Team Previews daily, in reverse alphabetical order, until the start of the season. Check out our ‘Previews’ section to see other team breakdowns.